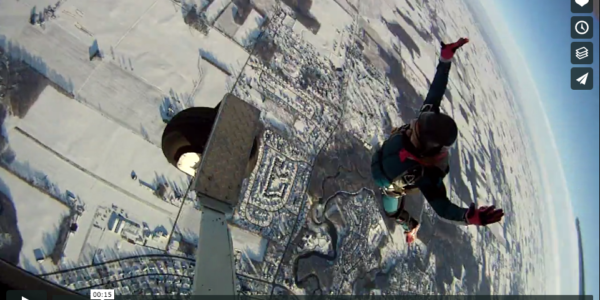 During the off season the most common question I get about skydiving is “Can you jump in the Winter?”. Skydiving in Michigan, and much of North America, is a seasonal sport. Depending how far North your drop zone is located will determine the length of the season. Here in West Michigan we open in early April for our annual Safety Day to reacquaint ourselves with skydiving after the off season and continue until the end of October. Typically, April, half of May, half of September and October can be hit or miss with weather and the bulk of our jumps happening in June, July and August. To answer the question of whether or not we can jump in the Winter….. Yes we can…. The reason we don’t is a real shocker. It’s COLD! The temperature descends as you ascend by a value of about three degrees for every one thousand feet. So, if the temperature is twenty five degrees at the surface you can expect the temperature at jump altitude to be at or below zero. Factor in the wind chill and you will encounter temperatures in free fall of -40 degrees. Not fun and not safe, two things generally unacceptable in the sport of skydiving. I will tell you the jumps I have made during the winter are very few but also very memorable reminiscent of soaring over a frozen Moon that is orbiting a planet in the outer solar system. Many skydivers from Michigan will travel during the Winter to scratch the itch in a warmer state like Texas, Arizona, Florida or California. This is a great opportunity to jump where it might even be too warm to jump comfortably in the Summer when the temperature is perfect right here in the mitten. While we would love to jump year round in Allegan, the Winter gives us the opportunity to reset and prepare mentally and physically for another season. This keeps us fresh and helps prevent burnout so when you visit the drop zone we can keep the energy level high to maximize the experience. Management takes time during the off season to scrutinize booking and check-in procedures and evaluate safety and training protocol. 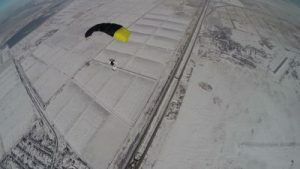 The parachute rigger makes repairs, sends gear out to manufacturers for inspection and return to service and re-packs emergency parachutes in preparation for the upcoming season. In addition, the aircraft get their required FAA annual inspections along with preventative maintenance to ensure their continued service and airworthiness throughout the skydiving season. In conclusion, take the opportunity as a skydiver to maximize your off season by re-connecting with yourself, your family and your friends who might not see you as much when you’re skydiving or at the drop zone. Make a trip somewhere you might not otherwise have gone had it not been for skydiving. Ask yourself why it is you skydive and make sure it’s for all the right reasons. Finally, get mentally and physically prepared for the season ahead. Spring is coming! We look forward to seeing you at the drop zone.